Have you ever attempted to study a workbook that refused to lay flat? Or fought with a cookbook that kept changing pages, right when you were elbow deep in flour? This is why Wire-O®, sometimes referred to as twin loop, is the perfect binding solution when readers must interact with the content beyond simply reading it. Your printed piece can open to a single page with ease and can lay flat for convenience, simply by choosing the best custom packaging solution to bind your product. Wire-O® bound is sometimes mistaken as spiral bound, or coil bound. Spiral and coil bound are actually a single continuous loop that is threaded through the holes punched in the spine of the booklet. Spiral binding is a popular method for notebooks. One benefit of Wire-O® is that it provides durability and has a polished, professional look. The wires start in a "C" form and are tightened into the holes of the document, securing up to 1.25 inches of paper. Depending on the thickness of paper stock you select, your Wire-O® project can have 4 to 350 pages. Wire-O is available in a large selection of colors to accent your design. The end result is a round-edge wire closure that is both sturdy and attractive. In addition, Wire-O® binding secures the pages in perfect registration, meaning they are aligned edge to edge when opened. This unique product packaging provides an optimal solution for books that require overlays including diagrams, floor plans, info-graphics, and site layouts. Since the pages lay out flat, side-by-side, double-page spreads, or crossovers, can be incorporated, combining the two pages full dimensions. Some examples of this application would be plat maps, flow charts, large graphics, or drawings. Front and back cover for Wire-O® bound materials can be either the same stock as the main pages, or a heavier cover stock that acts as a protective barrier for the book. We offer custom combinations to meet any need you may have. We can even do specialty work if you want your cover to have a die cut or maybe an embossed title to add extra pizazz. Multiple sizing options are available. We can also incorporate variable data printing, which means that if you want a specific image or personalized text on each booklet, we can accommodate you. We offer tabbed papers if you need to divide your book into sections that are easily accessed. For example, if you are printing a Wire-O® cookbook, you can tab "Appetizers, Main Entrée's, and Desserts" to improve the functionality of your piece. 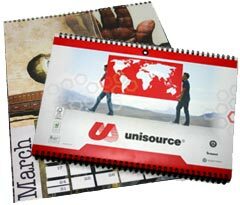 Contact one of our friendly print experts to help you get the professionally bound product you envision.